Beginning at 7 pm at the St. Charles Memorial Gardens (3950 West Clay Street, St. Charles, MO), this event will pay tribute to officers and friends, who have paid the ultimate sacrifice. The program will include guest speaker, Prosecuting Attorney, Tim Lohmar. “We thank the men and women in public service who put their lives on the line to protect us and our community,” said Lisa A. Baue, president of Baue Funeral Homes, Crematory, and Cemetery. 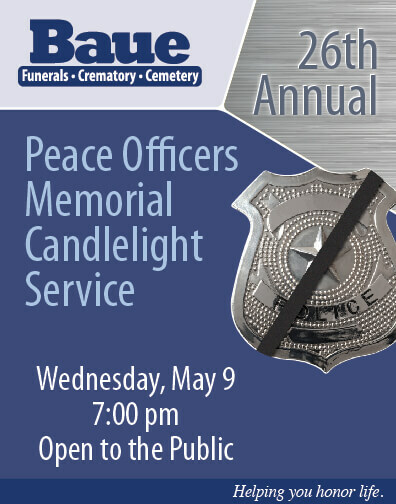 The event is co-sponsored by the Peace Officers Memorial Committee and Baue Funeral Homes, Crematory & Cemetery – it is free and open to the public. For more information, visit Baue.com or call 636-947-0622.